Spreading the word for 15 years! Tongue & Groove Orange County II! Tongue & Groove is a literary variety show of short fiction, personal essays, poetry, spoken word + music. The L.A. series produced by Conrad Romo is in its 11th year and this is our second show in O.C. (co-produced by Cynthia Romanowski). This time we’ve partnered with Gatsby Books who will set-up a pop-up book store at the event. 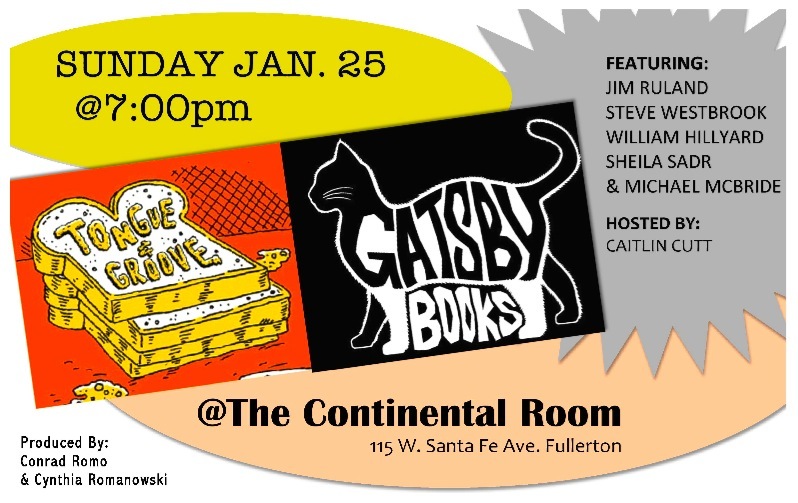 Sunday Jan. 25 at 7pm. 115 W. Santa Fe Ave.
Jim Ruland is the author of the short story collection Big Lonesome and co-author with Scott Campbell, Jr. of Discovery Channel’s Deadliest Catch of Giving the Finger. His debut novel is Forest of Fortune, by Tyrus Press. And on occasion you can read a book review of his with the LA Times or attend his popular reading series called Vermin. Steve Westbrook is an associate professor of English at California State University Fullerton, where he teaches courses is rhetoric, poetics, and cultural studies, and where he serves as faculty advisor for DASH Literary Journal. His poetry, which was nominated for a Pushcart Prize, has appeared most recently in Slab, Rattle, Pank, The Los Angeles Review, Literal Latte, The Great American Literary Magazine, Good Foot, and Clementine. Westbrook’s chapbook, Vox Americana is forthcoming from Orange Monkey Publishing. William Hillyard For approximately 48 hours, William Hillyard was executive producer of “Wonder Valley,” a documentary TV project inspired by his essays set in California’s desert fringe. Prior to that and since, he’s been unemployed. Michael McBride is a novelist, actor and security guard. Michael grew up in scenic northern California but now lives with his wife and two sons in the parched Los Angeles neighborhood of Mt. Washington. He enjoys the view from his deck, meals with family and friends, and rooting against the Los Angeles Dodgers. Michael is currently studying fiction at UCR’s low res MFA in Palm Springs. He graduated with a BA in from the UCLA School of Theater, Film and Television where he studied acting and playwriting. Caitlin Cutt is from Long Beach, and she’s currently putting her degree in Comparative World Literature to good use by embarking on a career in stand-up comedy. She got her start at Flapper’s Burbank, and is gaining steam performing all over the Los Angeles comedy scene. Currently, Caitlin´s career goals are simple: hosting The Tonight Show and getting the opportunity to finally hug Steve Martin who, unbeknownst to him, basically raised her via airwaves…and of course, she loves working on story-based material. Lisa Douglass is influenced by bad boys and tragedy, alcohol and fine literature. She is also an actress and a writer with an MFA in fiction from UC Irvine. Tongue & Groove Goes Virtual! Tongue & Groove is Back March 22, 2015!